Let it be said that this time of year, the most wonderful time of the year, is meant for caroling and baking cookies and decorating trees and putting up lights and skating on lakes and wrapping our hands around mugs of hot cocoa. Let it be said that this time of year is meant for celebrating good tidings, family and friends, blessings and a humble birth in a manger. Let it be said this time of year is not for worrying about the silly little things, risking your bank account or life for that “perfect” gift, opening old wounds and harboring resentment. I know it’s a tough truth to grasp, and I am the first to admit that I’ve spent a ridiculous amount of this month worrying instead of celebrating. Though there still were cookies involved. But now, three days before Christmas, I’m done. I’m done worrying and I’m forging ahead, focusing on the things that really matter this season and really, at any time of the year. And this cornbread? Well, I’ll be sure to eat a slice the moment I feel like my skates are losing ground again. 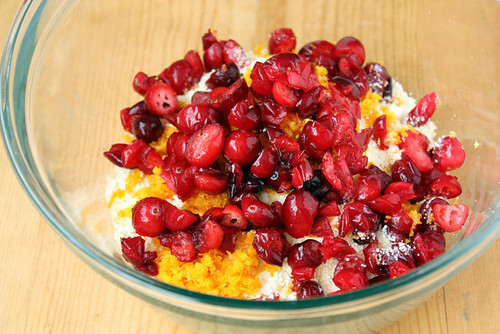 I don’t know what it is about the flavor combination of cranberries and oranges — Its tartness? Its sweetness? Its prettiness? — that makes me love it so. But I just knew that, when met with my other love, buttery cornbread, this pair would be magical. And it was. And now I’m off, this cornbread in tow, to share that magic and the holiday with loved ones. I wish you — cornbread or no cornbread — a little bit of that Christmas magic, too. Preheat oven to 350 degrees F (325 degrees F if using a dark or non-stick pan). 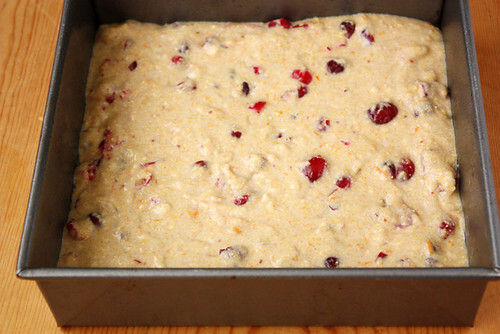 Grease an 8-by-8-inch baking pan and set aside. Love the fruity addition tyto the cornbread! 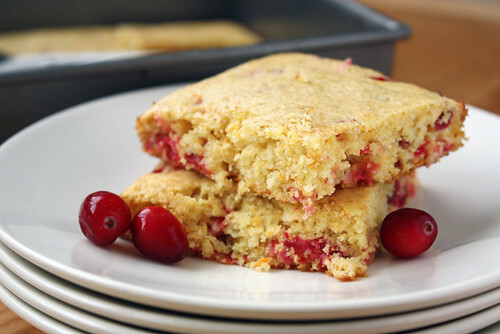 This cornbread is incredible and thanks for sharing! I’ve been inspired to feature this post in today’s Friday Food Fetish roundup. If you have any objections, please let me know. Have a wonderful holiday and keep amazing food coming! 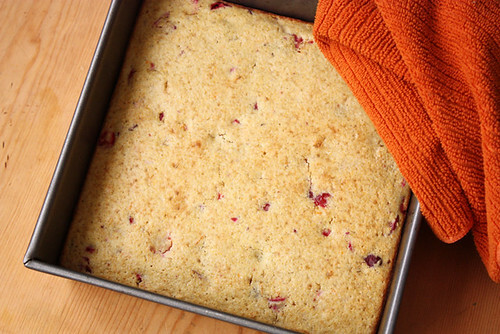 I love cooking with cranberries! This recipe looks like a really creative use of them. Thanks for the great post!